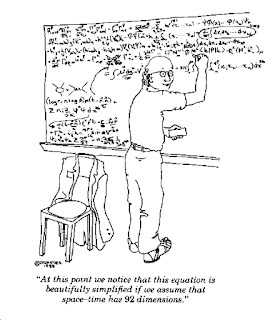 Basically many theoretical physicists are partial towards one particular number of dimensions because the multidimensional mathematics that they develop to represent a framework for the nature of the universe becomes much more simple (or elegant) when a certain number of dimensions is assumed. We of course don't know which conclusions are true. Many of our string theorists support the theory that our universe has 10 or 11 dimensions (11 dimensional universes are sometimes described as involving 10 normal dimensions coupled with a time dimension). I wonder if our species is biased towards concluding that the universe is a variant of 10 dimensions (10 or 10+1 dimensions) because of a pre-existing bias towards preferring the number 10. We have 10 fingers and use a base 10 number system (a number system where the tenth number forms the smallest number represented with two digits). This makes us wonder: if humans had evolved with 4 digits on each hand instead of 5, would we be using a base 8 number system instead of base 10? 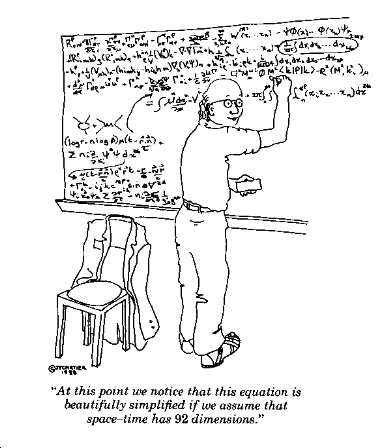 Would we be more inclined towards concluding that the universe has 8 or 8+1 dimensions rather than 10 or 10+1 dimensions? 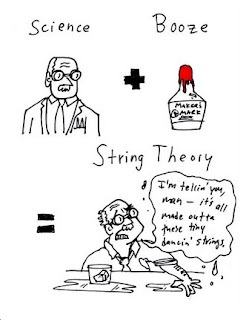 A previous brief humourous note on string theory is also available - you can check it out here.